Looking for high quality Cyprus cycle hire? 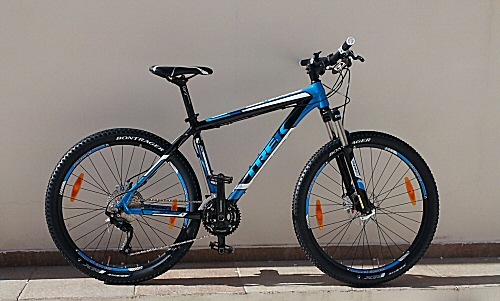 Find Trek mountain bikes and Felt race bikes at Wheelie Cyprus based near Polis in Cyprus. If you're a keen cyclist and you want to discover unspoilt Cyprus on two wheels, then you need a good quality bike, whether it's for off-road or road use. After all, you don't want to get stuck in the middle of nowhere with a bike that doesn't work. While some people choose to bring their own bike on the plane, packing a bike takes time and many people just don't want the hassle, not to mention the expense, of carting a bike box to the airport along with the rest of their luggage. That, and the risk of your pride and joy being damaged en route. So it makes sense to go for Cyprus cycle hire, especially if you only want to ride for a few days, maybe as you have family with you and that's all the time you can spare. But where do you find a good quality mountain or road bike to rent? 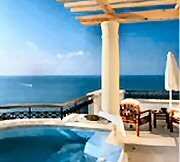 Tip: I have the answer for you if you're coming to north west Cyprus and the Polis Chrysochous region - just contact Wheelie Cyprus . 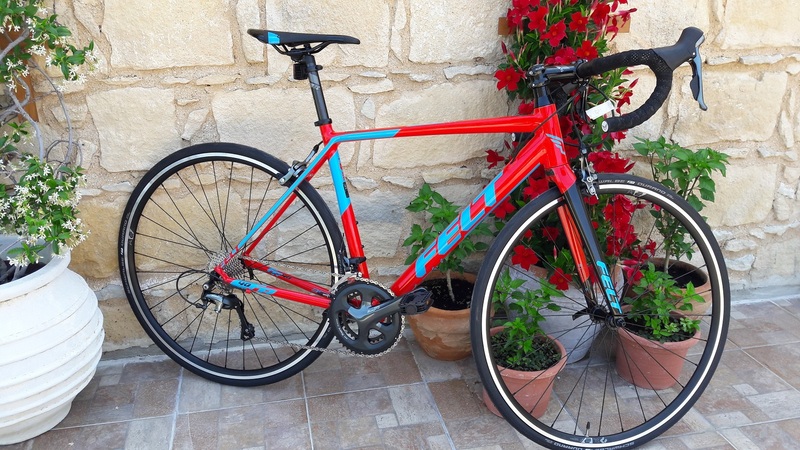 If you want high quality road bike hire Cyprus, you can rent a Felt FR40 race bike (NEW for 2018), an aluminium frame bike with carbon fork and seatpost, compact gearing and full Shimano Tiagra components. Included in the hire price is a helmet, gloves and water bottle plus mini tool, spare tyre, pump and tyre levers. Delivery is FREE in the Polis/Latchi area. You'll also be given suggested routes and there's optional GPS hire too if required. Find out more about the Felt road bikes offered by Wheelie Cyprus here. Tip: There are some excellent scenic road routes in the Polis area with challenging hill climbs for those that want them and best of all - virtually no traffic! If you want to explore the myriad of off-road trails like the rugged tracks on the Akamas peninsula or scenic hill climbs in the Paphos forest, then look no further than these two high spec mountain bikes. NEW for 2017 is the Felt Nine 50, a 29" wheel hardtail mountain bike with Shimano XT/Deore drivetrain, Rockshox XC30 fork, 3x10 speed gearing and Shimano hydraulic disc brakes. 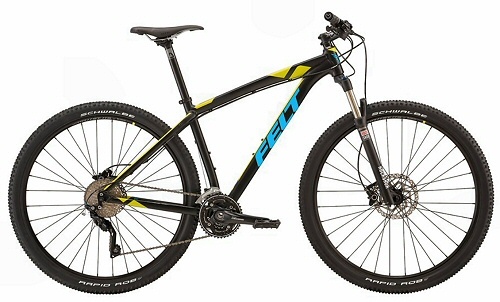 If you prefer a 26" wheel set-up, then choose the equally high spec Trek 6000 which also comes with 10 speed gearing, hydraulic disc brakes and front suspension plus Shimano XT/Deore components. Either bike will keep you going all day, no matter what the trail or the weather. As with the road bike cyprus cycle hire, mountain bikes come with helmet, gloves, water bottle plus mini tool, spare tyre, pump and tyre levers plus free delivery in Polis. Tyres have Slime inside - a tyre sealant meaning punctures are rare - and there's a full support service if you get lost, have a mechanical or you're just too tired. Mountain bikers who don't know the area like to make use of GPS hire from Wheelie Cyprus where routes are pre-programmed, so all you need to do is choose the route and press go. Tip: Wheelies even offer an uplift service for those who don't want to climb any hills, but want the thrill of riding downhill from a high point. How cool is that? If you don't want to cycle off-road and you're not a 50km per day roadie, Wheelies also have a few older bikes equipped with hybrid tyres - perfect for people wanting to explore the many flat back-roads and non-technical gravel tracks in the Polis area. So if you need to find high quality Cyprus cycle hire, take my advice and contact Wheelie Cyprus for a quote.